I spent the morning replacing old door knobs and power outlets around the house. These items were purchased from both Lowe’s and Home Depot — America’s two retail home improvement giants. The stores in our neighborhood are next to one another, and I sometimes can’t decide which one to choose. Perhaps this has to do with the price of lumber or something. Thoughts? 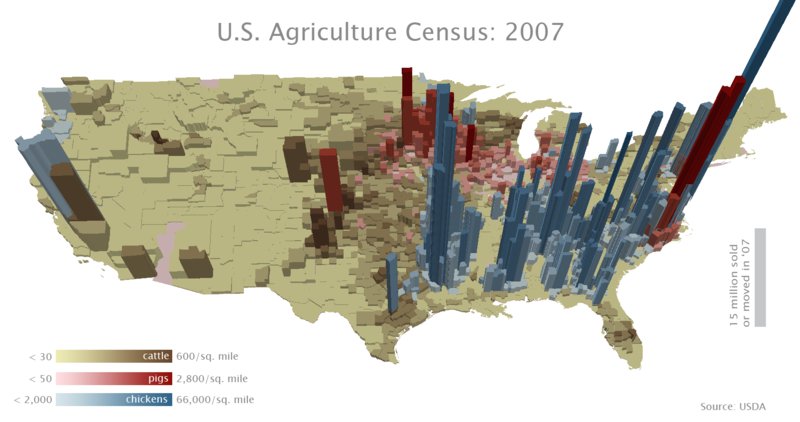 Inspired by Bill Rankin’s maps, I downloaded the U.S. Census of Agriculture, which counted the number of food animals sold and moved off farms in each American county during the 2007 calendar year. This map below, created in ArcGIS 3D Analyst, details only those figures for cows, pigs and chickens. Darker colors in the respective food categories represent higher county-by-county animal density levels during the year. The taller 3D extrusions represent total animal sales from farms over than time. It’s clear from this map that chickens are largely raised in the south, though a significant number appear in a tri-state region around Chesapeake Bay (a situation that’s causing serious environment implications). Pigs come from the Mid West (Iowa, mostly) and North Carolina. Cattle are concentrated through the Great Plains, as one might expect, and pockets in the West. Who doesn’t like salsa, right? It’s America’s number-one condiment, at least in the mind of George Costanza. But not all states like it the same, apparently, according to Google, which ranks places by their search terms.